Editor’s note: August is National Immunization Awareness Month. Dr. Deborah WexlerAccording to the Centers for Disease Control and Prevention (CDC), the rate of acute hepatitis B virus infection in the U.S. has declined by more than 80 percent since 1990, when routine hepatitis B vaccination of babies was implemented. While this is certainly good news, there are still about a million people in the U.S. today who suffer from chronic hepatitis B virus infection. It is also important to know that the likelihood of acute hepatitis B infection becoming chronic is higher the younger a person is when infected. 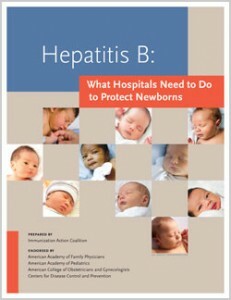 Approximately 90 percent of infants who are infected will develop chronic infection; worldwide, most people with chronic hepatitis B were infected at birth or during early childhood (IAC) launched a major campaign in July—Give Birth to the End of Hep B—that urges the nation’s birthing institutions to adopt or strengthen their hepatitis B vaccine birth dose policies. A policy that ensures all newborns receive a dose of hepatitis B vaccine after birth provides a “safety net” to protect all newborns against potentially tragic outcomes and save lives. Experts agree that hepatitis B can be eliminated in the U.S., and that preventing transmission at birth is essential to this effort. In fact, administering a universal birth dose of the hepatitis B vaccine is a major part of CDC’s Advisory Committee on Immunization Practices’ (ACIP) 2005 strategy to eliminate hepatitis B virus (HBV) transmission in the United States . In 2011, the U.S. Department of Health & Human Services (HHS) echoed ACIP’s recommendations in its Action Plan for the Prevention, Care and Treatment of Viral Hepatitis . HHS further recommended birth dose coverage as a standard of care and a national quality measure. Yet despite expert consensus on the importance of a hepatitis B vaccine birth dose, nearly one in three U.S. newborns leaves the hospital unprotected. As a result, approximately 800 U.S. newborns become chronically infected each year because of perinatal exposure. The centerpiece of the campaign is a free, comprehensive guidebook that contains a wide range of resources to help birthing institutions establish, implement, and optimize their hepatitis B birth dose policies. This IAC publication, “Hepatitis B: What Hospitals Need to Do to Protect Newborns,” is endorsed by the American Academy of Family Physicians, the American Academy of Pediatrics, the American College of Obstetricians and Gynecologists, and the Centers for Disease Control and Prevention. Provides a safety net to prevent perinatal transmission when medical errors occur. With the launch of its new guidebook and corresponding Hepatitis B Birth Dose Honor Roll, which recognizes birthing institutions that have attained high birth dose coverage rates, IAC urges hospitals and birthing centers to Give birth to the end of Hep B . For more information about the campaign, and to download the guidebook, visit immunize.org/protect-newborns.